Eybler comes down to posterity carrying some powerful testimonials. Writing to the music publisher Artaria in 1787, Haydn told him of �a young Viennese composer by the name of Joseph Eybler� who, he declared, was �very promising, plays the pianoforte well, and knows a great deal about composition�. In 1790 Haydn was writing of Eybler�s �outstanding talents� and affirming that �he possesses ... all the musical and theoretical knowledge necessary to pass with distinction the most difficult examination of any musical judge�. �I, the undersigned, attest herewith that I have found the bearer of this, Herr Joseph Eybler, to be a worthy pupil of his famous master Albrechtsberger, a well-grounded composer, equally skilled in chamber music and the church style, fully experienced in the art of song, also an accomplished organ and clavier player, in short a young musician such, one can only regret, as so seldom has his equal�. Eybler was appointed deputy Hofkapellmeister (under Salieri) in 1804. In 1824 he succeeded Salieri as Hofkapellmeister. He was distantly related to the Haydns and became a friend of Mozart � he helped to coach the singers in preparation for the premiere of Cosi fan Tutte, and helped to nurse Mozart at the end of his life. Indeed, Constanze initially asked him to complete the requiem � a task he felt unable to undertake. 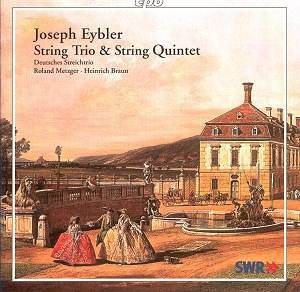 For all their recommendations of him, Haydn and Mozart might also be said to have done Eybler a disservice. Until recent years, interest in their music has put that of Eybler almost wholly into the shadows. But, in the last few years, there have been recordings of some of his church music (see review), his two symphonies (see review) and of his chamber music. Indeed Donald Satz chose an earlier recording of the String Trio as one of his recordings of 2005 (see review). All of these recordings have been well-received and Eybler looks to be well on the way to renewed recognition. And so he should be. He is evidently a composer of real interest and ability - as Haydn and Mozart told us! Naturally, his music belongs securely within the traditions of Viennese classicism, but it is not without its attractive idiosyncracies. This string quintet, for example, employs the rare � possibly unique � instrumental line-up of violin, two violas, cello and double bass. The resulting emphasis on the lower registers gives a distinctively rich texture to the music, port rather than wine. The writing for the violas is particularly fine. Though the violin gets most of the solo space the other instruments are not neglected. The six movements of what is, in effect, a divertimento for string quintet, are characterised by a beguiling mixture of gravity and charm and there�s no shortage of ideas � whether melodic, rhythmic or colouristic. The whole is a delight, from beginning to end. The first time I listened to it, I played it straight through again. The trio has real merits too and, like, the quintet, more than a few echoes of Haydn. Not specific borrowings so much as the exploitation of compositional ideas and devices which had, effectively, originated with that great master. Again, the presence of the viola, rather than the expected second violin, contributes a freshness of texture to the piece. The Deutsches Streichtrio and their colleagues give assured and idiomatic performances of this music. I haven�t heard the recording praised by Donald Satz, so I am unable to make any recommendation as to which which would be the better purchase. Suffice it to say that no one interested in the chamber music of the Viennese classical tradition is likely to regret the purchase of this particular CD.